For some reason I got a pretty strange idea in my head over the last few days. After mulling over its feasibility, I've decided to go ahead with a proposal, and see what the community thinks. In short, in Doom/Ultimate Doom, as you know, there is a map at the intermission screen, with you going into and out of various levels, with the map helpfully pointing out where you're going, but of course, the levels themselves don't even resemble these locations at all. I thought "Why not make a set of levels that actually resembles these locations?" 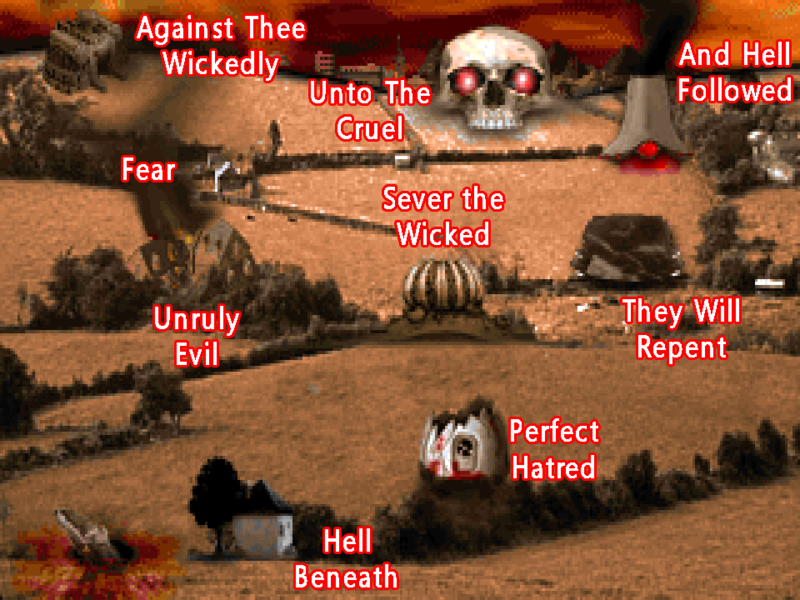 And thus, "Ultimate Doom: By The Map" was born in my head. We've had projects that reinterpret Doom levels by their names only (Ultimate Doom In Name Only), by the features of advanced engines (Knee-Deep in ZDoom), and so on. To the best of my knowledge, there hasn't been a project done that actually tries to make levels that resemble what is displayed on the intermission map. The rules for a project like this are pretty simple. I'll be stating the main point of the rule; to keep that section fairly brief without glazing over everyone's eyes; you can click the spoiler box beneath the main point for further explanation. Community opinion has spoken, and we are switching the IWAD on this project from Doom II to Ultimate Doom. The final tally was 39 votes in favor of Ultimate Doom, 13 for Doom II. Therefore, all the limitations of Ultimate Doom are going to be in force. Maybe (key word "maybe") down the line there will be a Doom II version of it, but the main project will be tuned for Ultimate Doom. Obviously, you'll be mapping levels that are based upon their external appearances in Ultimate Doom's level intermissions. The resolutions for some of them are pretty low, so understand we're not expecting perfection here - just try to make it as close as you possibly can. 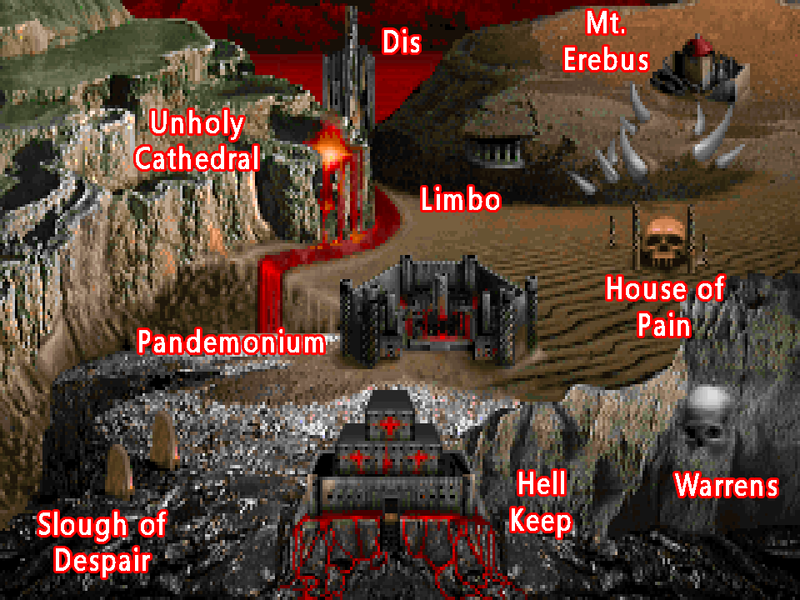 Owing to the fact that some of those level structures are very obviously 3-dimensional (no way are you doing a 3-story building like Hell Keep with vanilla's flat nature - not without lots of painful trickery, anyway), we are going to aim for GZDoom here. I know it's not the only source port out there that could fake 3D effects, but it's probably the easiest common denominator at this point. Since we're taking advantage of GZDoom (and relatively recent GZDoom at that), stuff like portals, ACS scripting, Doom 64-style lighting, 3D Floors, and so on is all fair game - while we're trying to keep a fairly vanilla feel and experience, we aren't going to be making something vanilla-compatible here, since just making a more "true" 3D-nature effect automatically DQs us from Doom/Boom compatible for the most part. Maps' basic floor plan must naturally resemble whatever they look like from the outside. If you wish to do an Episode 1 or Episode 2 map, you do have a secondary option available to you - @Wraith777 has kindly donated his attempts at a previous stab at this idea that he called "Real DooM," and has given permission to make use of and modify the maps as we see fit. You can download them and use them as a basis for a map from this link here if you would prefer to not make an entire map from scratch. Note that only layouts for Episode 1 and Episode 2 (up to E2M7) exist - E2M8, E2M9, and all of E3/E4 are not covered by his donation to the project (because he never made ones for those). As a gesture of thanks and respect for him, any maps made that make use of his versions as a base will be co-credited to him and the other mapper who modifies his maps accordingly. If the outside is shown during gameplay, try to resemble it as it appears on the map as much as possible, as well as in terms of the overall layout (where applicable - kind of hard to do that when you're, for example, a skull in a cliffside). For the interior, pretty much anything goes, as long as it's thematically appropriate. Remember, the outside appearance is mostly what matters - there's plenty of ways to add breadth and depth beyond the limitations of the "physical appearance" of the map if you think about it. I don't see any reason to demand a specific map format, but UDMF is actually necessary for some stuff (like D64-style lighting). That said, since map formats can be mixed for GZDoom, if you would rather do Hexen or Doom format maps, those are fine too - just be aware of the various limitations of those map formats. I'd recommend UDMF if you don't know what you want to pick - it's a tiny bit harder to learn, but the vast flexibility increase is worth it IMO. Thy Flesh Consumed's levels will be based on the third-party thyinterpic.wad, which (to the best of my knowledge) was made by Xaser and Skunk. While I am aiming to do the four Ultimate Doom episodes (hence the name), if there's only large demand for the first three episodes, I will cut it down to the original three episodes. REGARDLESS OF IF THE SCOPE GETS REDUCED, ANYONE WHO MAKES A LEVEL FOR THE ULTIMATE DOOM LEVELS WILL HAVE THEM INCLUDED. They will simply be bonus levels in addition to the main ones if the demand just isn't there for a full Episode 4 map set. Takes on Romero's Sigil levels (assuming they don't come with such an intermission map) won't be included, unless someone wants to be crazy enough to make an intermission map for them based upon whatever names he winds up giving the levels. If someone wishes to, then I will include map slots based on the custom intermission map as fair game, and the project will expand from 36 to 45 levels accordingly. Custom resources should be fine as long as we have permission for them and are thematically appropriate. I'd generally prefer to keep this to textures or decorations as opposed to new monster or weapon types, but if the community thinks we should have those, that would be considered. Finished maps should get sent to me; I will then pack them up and when a significant number of new maps gets released, put out a new version for testing/feedback purposes. Mappers of all talent are welcome, and while there will be level "slots" there is no such thing as exclusivity for a slot - any number of mappers can submit a map for any given map slot. If someone did a version of E3M1: Hell Keep and you think you can do it better, go ahead and do it! In this case the community/team will get to vote on what one they think is better, and the one that wins out will get to "officially" keep the spot when the final version is compiled. The loser(s) won't go home empty-handed, though - they will be compiled into some kind of alternate WAD, as someone who took the effort to make a map shouldn't just have their hard work forgotten, and the project isn't officially done until a final version with all slots filled has been made anyway. Mappers also don't have to pick just one map to do - if you'd like to contribute several, go right ahead. While I'm not going to be strict on it, to preserve Doom's "slow drip" of steadily expanding the weaponry, enemy roster, and powerup composition, I am going to moderately enforce some placement rules. Some are more flexible than others - maybe we'll move when a monster or pickup makes its first appearance, but you're not putting a Baron of Hell in before E1M8, for example. The spoilertagged box below (which I lost a bunch of times while writing it since Ctrl-Z would erase the whole thing... so appreciate it! A non-WYSIWYG mode would've solved this completely...) will have all the necessary info in terms of the original game. In general, this episode is meant to be fairly easy and to get the player's feet wet. A lot of decent stuff is out in the open, but players who hunt for things generally get better armed and armored. Health and ammo are fairly generous, and powerups are often free rewards. Chainsaw: First appears in E1M2 as a secret. It never appeared openly in this episode, but was in two other maps (E1M5, E1M6) as a secret. Shotgun: E1M1 as a secret, E1M2 openly. The exception to this rule is that on UV/NM, Shotgun Guys appear on E1M1. Chaingun: E1M2 as a secret, E1M4 openly. Rocket Launcher: E1M3 as a secret, E1M5 openly. Plasma Rifle: Not found in Episode 1. BFG9000: Not found in Episode 1. We're sticking to shareware/E1 rules here, generally. That means basically fodder enemies, and nothing that's more powerful than Demons with the exceptions of the end-boss Barons, of course. In terms of enemies, you'll be thinking more about quantity than anything. Zombiemen: Available in all maps and difficulties. Shotgun Guys: E1M3 and later on HMP and lower, all maps on UV+. Imps: Available in all maps and difficulties. Demons: E1M3 and later on all difficulties. Spectres: E1M9 on HMP and lower, E1M3 and later on UV+. ITYTD/HNTR: Only present in E1M6, E1M7, and E1M9. HMP: Same as ITYTD/HNTR, but add E1M5. UV/NM: Same as HMP, but add E1M3 and E1M8. Lost Souls: Not used in Episode 1. Cacodemons: Not used in Episode 1. Barons of Hell: Two, and only two, as the bosses of E1M8 on all difficulties. Cyberdemons: Not used in Episode 1. Spider Masterminds: Not used in Episode 1. In general, you can be fairly generous with your powerups - this is Episode 1, after all. Green Armor tends to be fairly reliably found, and even a Blue Armor in the open here and there isn't uncommon. Often, powerups found in secrets come with no strings attached. Berserk Packs: Not found in Episode 1. Soul Spheres: From E1M2 on, there's at least one per map. Some levels have two. Chainsaw: First appears on E2M2 as a secret, as well as E2M5. It is finally non-secret for the first time in the entire game on E2M6. Shotgun: Appears in all levels and difficulties. Chaingun: First appears on E2M2 as a secret. First appears openly on E2M3. Rocket Launcher: First appears on E2M2 as a secret. First appears openly on E2M4. Plasma Rifle: First appears on E2M1 as a secret, and in several maps thereafter (also as secrets). Finally appears openly on E2M5. Ironically, appears as a Multiplayer weapon openly on E2M2. BFG9000: Not found in Episode 2. Episode 2 sees the introduction of Lost Souls, Cacodemons, and the Cyberdemon as the end-episode boss. Barons of Hell get demoted to regular enemies, albeit their appearances are still fairly sporadic. Shotgun Guys: Available in all maps and difficulties. Demons: Available in all maps and difficulties. Spectres: E2M4 and later on ITYTD/HNTR, E2M3 and later on HMP, All maps on UV/NM. Cacodemons: E2M3 and later on ITYTD/HNTR, all maps on HMP and higher. Barons of Hell: E2M5 and later on ITYTD/HNTR, E2M4 and later on HMP, E2M3 and later on UV/NM. Cyberdemons: One - E2M8 final boss, of course, on all difficulties. Spider Masterminds: Not used in Episode 2. Powerups start becoming a bit rarer here. Blue Armors outside of secrets are rarely found, and Soul Spheres start being better hidden. Sometimes grabbing a goodie also springs a trap. Maps begin baiting players here - E2M5 had two pretty notorious cases of this with two crushing ceilings, one which you could avoid but the other guarded a yellow keycard. Berserk Packs: Appears for the first time in the entire game on E2M2. They appear every level or two from then on, and in almost all levels in Episode 4. Soul Spheres: First appears in this episode on E2M2. There is about one per map from here on, though E2M4 has three (albeit one is multiplayer-only). 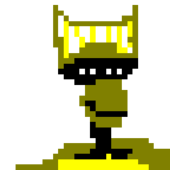 Chainsaw: First appears in E3M5, hidden behind an unmarked yellow door. It's "openly" visible in E3M6, but getting to its sector is a secret. It's only available truly openly in E3M9. Chaingun: First appears semi-secretly behind the "thumb" wall of E3M2. First appears openly on E3M3. Rocket Launcher: First appears on E3M1 in a secret. First appears openly on E3M2. Plasma Rifle: First appears as a secret in E3M2, behind the famous "arrow wall." First appears openly in E3M5. BFG9000: First found OPENLY nice and tucked away in a nook off the blood room in E3M3. Due to being first found openly, there is perhaps a little flexibility for when it might be found secretly - it never seems to appear in a secret. Zombiemen: E3M2 and later on all difficulties, but in small amounts. Shotgun Guys: E3M2 and later on all difficulties. Spectres: E3M2 and later on all difficulties. Lost Souls: E3M2 and later on all difficulties. Cacodemons: E3M2 and later on ITYTD/HNTR, all maps on HMP and higher. Barons of Hell: E3M9 and later on ITYTD/HNTR, E3M3 and up on HMP and higher. Approximately similar numbers as The Shores of Hell in terms of appearances - sparingly. Cyberdemons: Once, as a surprise boss in E3M9 on all difficulties. Spider Masterminds: Once, as the final boss in E3M8 on all difficulties. Much rarer now. Anything that's remotely good tends to be hidden carefully in secrets, even if it's just a couple of Medikits. Good stuff that's out in the open is usually a sign that a big battle's about to happen, or a devious trap - beware! Berserk Packs: First appears in E3M2. Occasionally used in place of Soul Spheres to provide good healing but not quite +100% Health. Found at about the same frequency as in The Shores of Hell. Soul Spheres: Also first appears in E3M2. Actually appear the most in this episode out of any of them (although Thy Flesh Consumed ties it on UV/NM). Always hidden away, always precious. 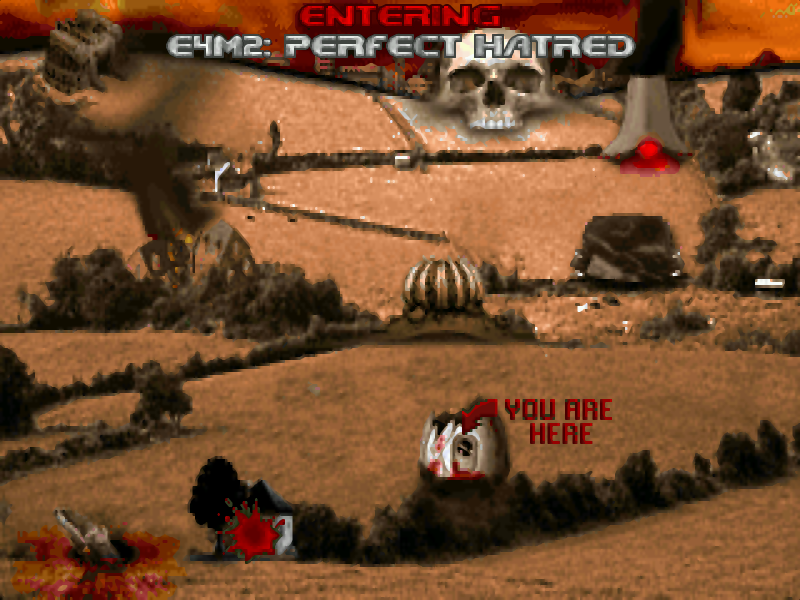 Chainsaw: First appears openly on E4M2 on all difficulties. Chaingun: Appears in all levels and difficulties. Rocket Launcher: First appears in a secret on E4M1. First appears openly on E4M2. Plasma Rifle: First appears openly on E4M2. BFG9000: First appears "openly" in the Cyberdemon sector on E4M2. E4M3 and E4M4 got a multiplayer-only one. You can finally get one without hunting on E4M5. Zombiemen: E4M9 and "later" on all difficulties. Zombiemen bounce back in a big way here, appearing in numbers that dwarfs even The Shores of Hell and is second only to their E1 appearances in terms of volume. Shotgun Guys: Appear in all maps and difficulties. There are lots, and I do mean LOTS, of Shotgun Guys in E4 - nearly as many as E1 on UV/NM, and actually more than E1 on HMP and lower. Definitely one of your bread-and-butter monsters for E4 mapping. Imps: Appear in all maps and difficulties. Volume is approximately equal to The Shores of Hell. Imps are always a bread-and-butter though. Demons: E4M2 and later on all difficulties. E4 has, surprisngly, the least amount of Demons of all the Doom episodes. Second-lowest episode on ITYTD/HNTR, approximately equal to E1 on HMP, and almost HALF of E1's total on UV/NM. In short, use them sparingly. Spectres: Appear in all maps and difficulties. There's almost as much Spectres on HMP and lower in E4 as in the other three episodes combined, and UV/NM is similar to E1 UV/NM in terms of amounts (which is still half the amount of UV/NM Spectres in the main game). In other words, be fairly generous here with them where appropriate. Lost Souls: E4M2 and later on all difficulties. Appear the least of any episode they appear in (i.e; not counting E1). HMP and lower has similar amounts as E2, but UV/NM has a good 30 less than E2. In short, use them where appropriate, but probably no need to go crazy with them. Cacodemons: E4M2 and later on all difficulties. A weird case where they're generally in-between. ITYTD/HNTR has them appearing about as often as they do in E2, but HMP and higher has them somewhere between E2 and E3 in terms of appearances - more than E2, less than E3. Barons of Hell: Appear in all maps and difficulties. Barons are plentiful in E4, appearing in ITYTD/HNTR almost as much as they appear on UV/NM on E2/E3, and anything from HMP on has not only the most appearances by them per-episode, but more appearances by them than in the other three episodes combined! Don't be shy on using them here. Cyberdemons: Two on HMP and lower, three on UV/NM. One on E4M2 (all difficulties), one on E4M6 (all difficulties), and one on E4M7 (UV/NM only). Spider Masterminds: One - once more as the final boss in E4M8 on all difficulties. Rare, rare, rare. Make them work for it. Then make them suffer afterwards so they don't get much breathing room. Berserk Packs: First appears on E4M2. Almost as much appear in E4 as they do in E2/E3 combined of the full game - 50% more than either of those episodes individually, but not quite as much as both of them combined. Soul Spheres: Also first appears on E4M2. Appearance rate similar to other episodes, but they are very deviously hidden - or given so you have a better shot of survival for the heavy flow (or very tough) baddie hordes you'll face. With those all said... all that should be left is to open the floodgates to any interested parties. If you're interested, just leave a post in here with what map(s) you'd like to do, and I'll be looking forward to seeing what you come up with! Good luck. Edited Friday at 02:23 PM by Dark Pulse : Thedoctor989 is attempting E1M3. If you're including Episode 4, does that mean its levels will be based on this? From thyinterpic.wad for the curious. EDIT: I'm dumb I thought because I didn't see it when I ctrl-f'd "episode 4" and "e4" that it just wasn't addressed but you already confirmed that's what you'll be doing. Yeah, that's exactly what I'd have. As I said, if someone's crazy enough to make one for Romero's E5 (as I'm assuming SIGIL won't have one), I'd include that as well. Just one more correction. The Tower of Babel is built as you progress through the second episode. P.S. Also the episode overviews should be in OP. Interesting idea, one could keep the levels Doom the way ID did-ish while still basing them off of the intermission screens. 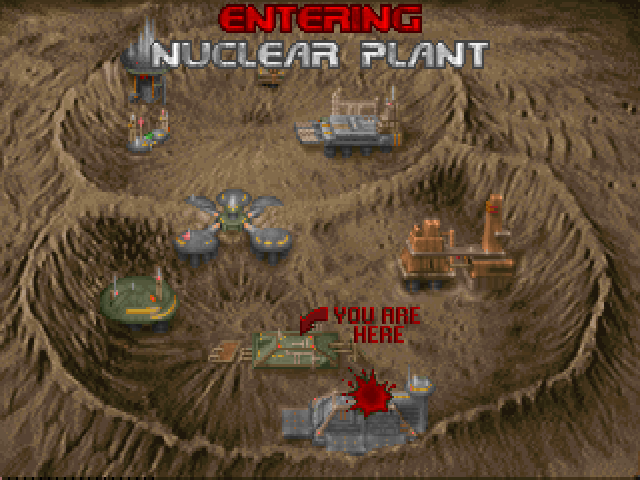 Could we maybe base it off a higher-detailed render, like this one I found of Nuclear plant for DooM HD? Also, perhaps a resource WAD that keeps things 'classic-y' while still adding the new. Here's a demo for a sample map I made for another project, though their final resource WAD probably won't be like mine. Nice. I had this idea for a while, good to see an actual project being started up for it. I would love to participate but I can't currently. If there are still open slots when I get back in gear I would take them. Good luck! Good point. I just added them, along with labels for clarification. Hopefully they're clear enough - if not, I can always add some circles and arrows or something. Maybe I could have them be animated GIFs/PNGs as well, it'd take a bit of photoshop work for me though, more than just slapping some simple labels on for. I'd have no problem with that - the resolution of the original intermission screen is so tiny that realistically speaking there's bound to be a little creative license. Obviously the goal is to have the layout and external appearance (if shown) approximate what's on the map from the outside, but other than that, anything goes on the inside. Realistically speaking, allowing for stuff like portals, 3D floors, and so on will allow us to sidestep a lot of limitations that the map may otherwise have off its physical dimensions alone. I'm not opposed to stuff like that in principle, but I'd want to be fairly careful about how much is changed. Even if we're making use of stuff that will step away from Vanilla (Yeah, mouselook, jumping, and crouching too), I don't want it to feel like a TC or like everything is hugely different. For the most part I still want some pretty classic Doom gameplay, with some enhancements here and there by virtue of the more advanced engine and what we can do with it. If we can get away with a new monster here or a new gun there and everyone involved thinks it'll be a fun idea, sure. But we'd definitely want to give the opportunity for maps to be tweaked by their makers if we add significant stuff like that, hence why I said for the most part it should hold to textures, decorations, etc. - adding new weapons and monsters is stuff that can actually change gameplay balance. We'd also want to keep in mind that Doom steadily dripped its stuff to its players - several monsters and guns don't make an appearance until Episode 2, obviously the Cyberdemon and Spider Mastermind are fairly protected, and by Episode 4 we can more or less let the gauntlets off and give the player some real fun for their gun. Prospective mappers would be wise to keep that in mind for Episodes 1 or 2! I see no reason to stick to the actual Ultimate Doom IWAD. 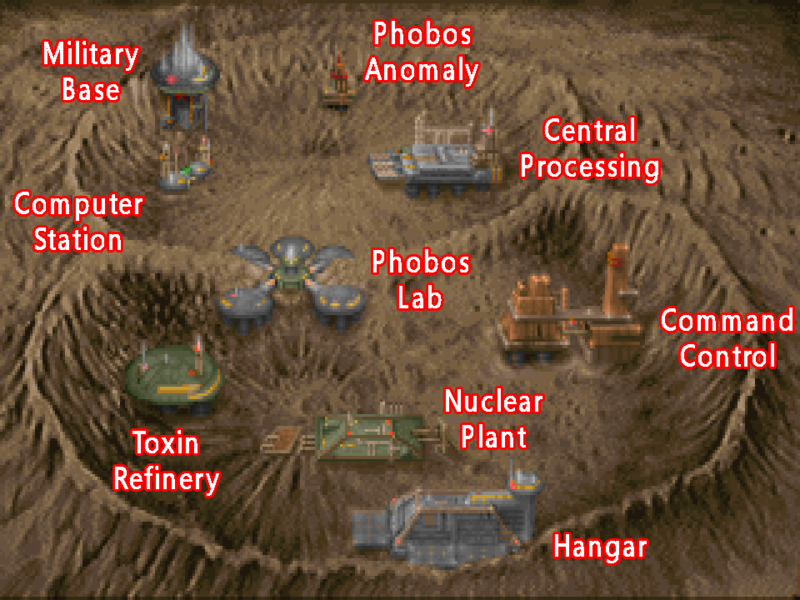 And so as to provide the maximum challenge, flexibility, and (most notably) to take advantage of the Doom II bestiary and content, I think the base WAD for the project should actually be Doom II. If need be, Doom 1 textures could be moved over if there's some textures a level maker wants that aren't in the Doom II IWAD but are in Doom. I think it's great that you are proposing this project and it makes me wonder why it hasn't been done before, but I wonder that you say there's no reason to stick to Doom.wad. That seems a bit disingenuous to me. It seems intrinsically obvious this should be a doom 1 project and that what you are selling to the doomworld community is the ultimate classic doom community project. 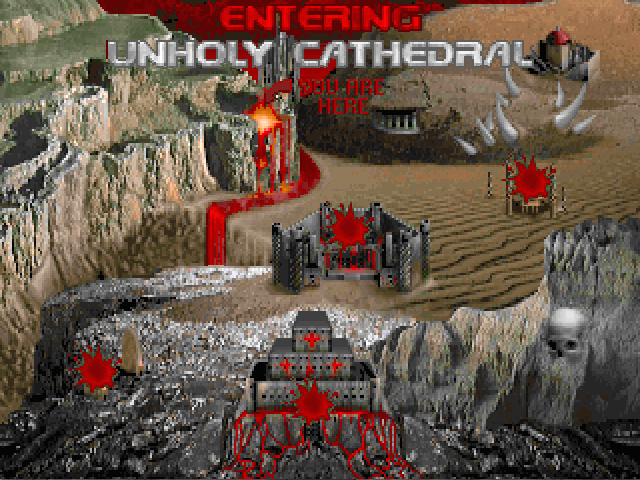 Those intermission scenes are loaded with nostalgia for most doomers, and loading up doom 2 and playing with doom 2 elements in sacred doom 1 levels that at long last! look like the locations on the intermission screen would pollute and dilute what would otherwise be the ultimate nostalgia trip, and strikes me as odd and detracting from what this project naturally is about. It's like, "let's do the ultimate classic doom project, but set it in doom 2 with doom 2 monsters...) Huh? Why? 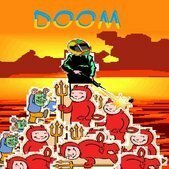 Surely we should do this doom project in doom? 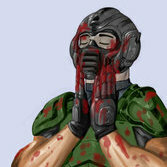 Not to mention the extra work of making doom 2 display separate episodes when all that code is already setup in Doom 1. I dunno, revenants and mancubi would detract from the great nostalgia kick this project ought to be. I can't imagine there will be more people in favor of doing this in doom 2 than doom 1. It's certainly up for vote and debate. I'm totally open to that, and if more people agree it should remain a UDoom-compatible WAD, I will change the focus of the project to that accordingly. Part of why I feel it shouldn't, though, is that in terms of Doom 1, the bestiary is actually kind of limited - Doom II really did add some mid-level bullet sponges, as well as some actual new and terrifying challenges (Revenants, Archviles). While I definitely get that "in name" it should stick to Ultimate Doom, in practice that actually might turn a few people off, because with the regular Doom bestiary, there's quite a few people who can put it all down in their sleep, and after the Cyberdemon/Spider Mastermind, your options for beefy enemies fall off sharply: The Baron of Hell, then the Cacodemon, and then you're down to stuff you can take out with a few single shotgun blasts. Plus, everyone loves the Super Shotgun, and this wouldn't even be the first time to allow you to use a Super Shotgun in "Doom" levels (PSX Doom let you get it in a secret area). Not to mention Doom II monsters turned up in Doom I maps on Ultra-Violence, and that was actually a hella unique thing - and an exciting new challenge. I'm not worried about setting up the display and code though for episodes and the intermission maps. That stuff's trivial. I mean, realistically speaking, it's not like the D2 monsters or SSG couldn't be ported via DECORATE, either, but to me, using the Doom II IWAD would just save us from some trouble. Not to mention that it's actually more likely people will have the Doom II IWAD than Ultimate Doom. But again, that's what debates are for. 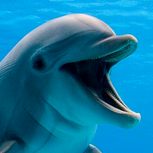 If the general sentiment of people is that I should stick to the Ultimate Doom IWAD, I'll do exactly that. Be interesting to see how Phobos Lab and Deimos Lab pair up with each other! And if people wanna use D1, my resource pack DOES have some Doom 2 goodies in it as well! Otherwise, I'll just basically make a UDMF map for this... E1M2! Nice idea, I always wished the maps actually resembled the intermission screen art. I'll try my hand at Hangar sometime in the next couple weeks and send in a rough version. Should the progression be similar to original Doom (as in, no Cyberdemons or higher tier enemies on level 1, for example) or is it free range? My gut tells me that it would be best to keep that progression fairly like the original in that sense, so it will be slowly drip-dropped over a course of episodes. Episode 1 is your basic fodder mooks, Episode 2 might introduce some newer nasties (especially if we use the Doom II IWAD), Episode 3 should be most of the bestiary available, and Episode 4 should try to kill you. This sounds like a great idea! I myself have wondered on occasion what the locations on the intermission screens would look like in actual game maps. It seems very intriguing. That being said, I'm gonna have to agree with Hellbent. I feel like this should be a UD project IMHO. I love Doom 2 as much as the next guy, but I personally lean slightly towards Doom 1 when it comes down to it, mainly for the nostalgia I'll admit but I also like it's "simplicity" in a way. At the very least, I think you should get more input from the community before deciding which direction we ought to go with that. I absolutely welcome more input on that, so if anyone wants to voice an opinion, go right ahead and feel free. Sign me up for Limbo! Sign me up for Phobos Lab! Interesting to see if whoever eventually does Deimos Lab will get influenced by your work, as well. Let's see what I can do over the course of this project, I'll have to learn some GZD tricks, if there are no hard time constraints I could work on in with no problem. Can't really ever be final until at least one stab at every map has been attempted by someone, so I'm not really setting any sort of time limit. It took me just now to realize that Phobos Labs and Deimos Labs both use the same graphic. Also Containment Area and Command Control looks like the same building but from different angle. They look a little different if you look carefully (Containment Area seems to have an extra tower Command Control does not), but they are definitely similar in a lot of ways, so likely again the same "base" model with just some tweaks.